We’ve known for a long time then that even though the basics are clearly laid out, there are at least some parts that are not obvious or plain. For thousands of years now, Christians have wrestled with, commented on, and interpreted the text of the Bible. Today we have seminaries with classes in hermeneutics, study of the original languages and ancient cultures that form the setting and background of the text, dictionaries, commentaries that are thousands of pages long, and journals where scholars devote dozens of pages to analyzing the nuances of a single word in the context of a single verse. (No joke, I wrote 30 pages on 2 verses in Colossians in my MA program and just barely scratched the surface of the literature on the subject.) Without a doubt, our knowledge of the text has expanded and been deepened by the faithful work of scholars and interpreters over the last few generations and this is a good thing. The people of God need preachers and pastors who will roll up their sleeves and get to work on the task of discerning what the Lord has spoken and is even now speaking in the text. Poor interpretation is at the root of so much bad preaching and teaching in the church, which leads to bad living by the church. Preachers, teachers, and even lay-people who have come to rely on them, still need to work at the task of interpretation. Now, to some this might seem troublesome and daunting. As someone who has devoted my life to wrestling with the text in order to teach and preach it faithfully, I absolutely love this stuff. Digging into the interpretive issues and the complexity of the Scriptures is what I live for. “What’s that you say about an ingenious new understanding of that obscure verse in Leviticus? Brilliant! Let me read it.” “Is that a new commentary on a book I finished studying last month? I must have it!” Anybody who’s seen my desk at home or at work knows that I live knee-deep in this stuff. I wouldn’t have it any other way. Now why do I bring this up? To alert us to a deadly risk we run when engaging in the interpretive task. 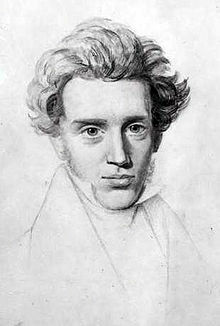 With this little parable Kierkegaard throws up a large, flashing, red warning sign for those of us enamored with the endless study of the text. The danger comes when interpretation becomes an excuse for disobedience. Kevin Vanhoozer has pointed out that the proper interpretation of the text of Scripture requires performance. Ingenious readings are not the point–hearing and rendering a fitting response to the voice of God is. When the task of interpretation eclipses our actual response to God speaking to us out of the silence, calling us to repentance, commanding us in righteousness, convicting us of sin, consoling us in pain, and drawing us to communion with Himself, things have gone awry. At that point you have sentenced the text to a slow and agonizing death by commentary. Do not mistake this for an anti-intellectual call to “just read the Bible” without trying to engage with it at that deeper level. Study the Bible. Wrestle with it. Don’t be satisfied with simplistic readings of difficult passages. Go read big books on the subject. At the end of the day though, we must never forget that when the “Word of the Lord” came to the prophets it didn’t come as a word to be inspected, dissected, and thereby domesticated, but as the mighty command of the King who intends for his subjects to hear and obey his voice. We study in order to hear–we interpret in order to obey. Nailed me; twice or more! This is a great reminder to those of us so dedicated to understanding and rightly interpreting that we can run the risk of forgetting “doing the Word” or even, substituting our interpreative genuis for raw obedience. Good work and thanks for the reminder friend.